It’s a scary world out there – at haunted attractions and escape rooms nationwide, owners and staff members work hard to scare up additional sales with souvenirs and food offerings. While a number of venues are still in the planning stages when it comes to these categories, others have established strong sales in good eats or souvenirs as well as scares. At the Escape Hotel in Hollywood, Calif., Co-owner Kitti Herczeg is still in the process of getting her gift shop set up. The attraction opened in July 2016, and offers ten escape rooms and she plans for a comfortable café as well as a fully stocked gift shop to extend the experience. While the full café with planned salads, bakery items, and sandwiches will not be fully operational until next summer, the attraction currently offers candy, cotton candy, popcorn, sodas, hot chocolate, and a variety of coffee drinks. “To improve sales we have the food items displayed near the front desk where guests will be sure to see them. They’re placed right next to the coffee, the popcorn, and cotton candy machines. Attractive display and the position of the display is what is important to increase sales,’ she related. Currently, candy is among her best-selling food items. Perry Lawson, the owner/operator and head chef, with Cliff Yelton, dessert chef, who is pictured, make the Graveside Grill happen at Milburn’s Haunted Manor, LLC. 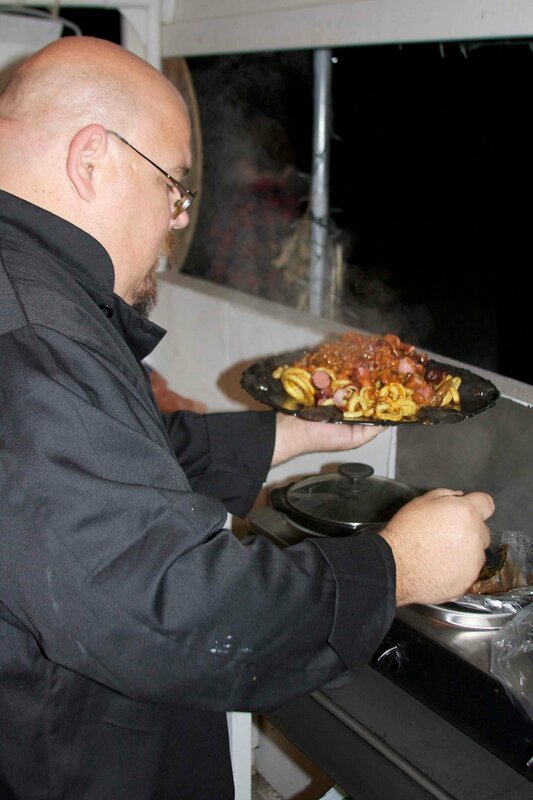 Yelton was photographed making a “Shallow Grave,” which is an order of fresh cut curly fries with chili, cheese, and a deep fried, bacon wrapped sausage dog cut up and placed on top. It is a best-seller for the serious haunt-goer. In Hubbard, Ore., Michael Milburn, owner of Milburn’s Haunted Manor, finds that when it comes to souvenirs, haunt guests are not big buyers. “We have offered a canvas bag with our logo on it; every year I make something with the Milburn name on it. I give items to our volunteers and offer them for sale to our visitors, whether it’s a hat, or a bag. We hang the items on a wall with signage indicating cost, but they don’t typically sell for us. People are already spending money on the haunt, and food, and they are just not that interested in souvenirs,” he attested. “One year, our concessionaire’s son wanted to sell some items, and he brought in things like rubber eyeballs and other Halloween-type items, but they didn’t do well enough for him to sell again. Another individual sold custom jewelry and flea-market type items one year, but those also did not sell well. I could make a fortune I suppose selling hand-warmers for chilly nights though,” he said. Food on the other hand has been a big success for Milburn. “We have what we call the Graveside Grill. We sell items such as deep-fried Snickers, curly fries cut fresh right here, and we do corn dogs. We have both a meal menu and a dessert menu, as well as selling chips, soda, candy, and things like that,” he related. The grill has two deep-fryers going the entire time the haunt is open. In addition to updating menu offerings and keeping the grill in a central location, offering samples and in-line sales are also keys to increased sales for Milburn. “The Zombie Donuts for example – we will cut them into quarters and walk up and down the line giving samples. On cold nights, we also take out a drink carrier with hot apple cider. We make lots of sales offering the samples and offering in-line purchasing of this yummy stuff,” he said. “Together, sampling and in-the-line sales really boost the overall sales of the food items. You can walk up to a group of six, and you might give away one sample and sell one drink, but ten minutes later, people are up there at the stand buying something. With a haunted attraction you get people often standing in line for a long period of time, so getting out there and working the line we find is really an effective selling tool. We see a 25% boost in sales when we do this.” The donuts, cider, and other deep fried items are top sellers for the attraction. While the success of food and souvenir sales depends on the haunt, and some attractions have not yet fully implemented these items into their sales mix, it’s not scary to surmise that offering an appealing mix of food and souvenir items will provide haunt and escape room visitors with more fun to experience, while offering attraction owners increased revenues.